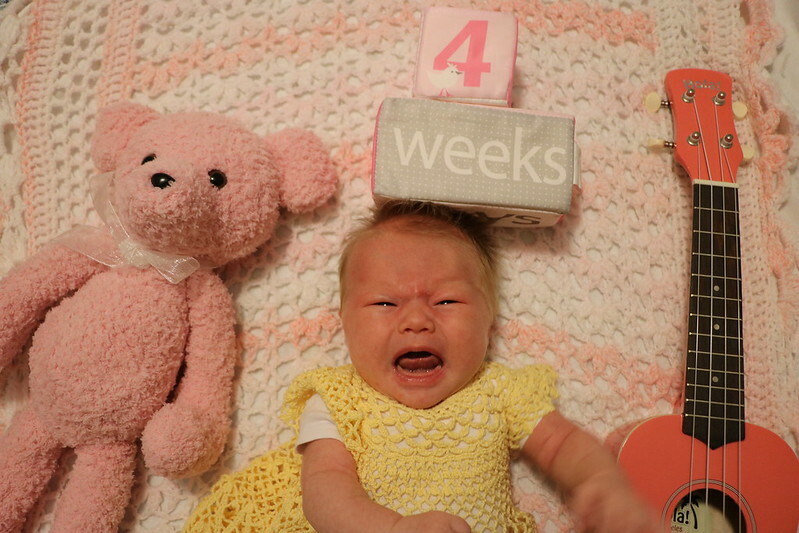 Today marks 4 weeks for Ruby. I can’t believe the time has passed by so quickly. But in other ways, she has grown so much and we’ve learned so much. She is due for her 1 month check-up later this week, so we’ll get updated height and weight measurements then. 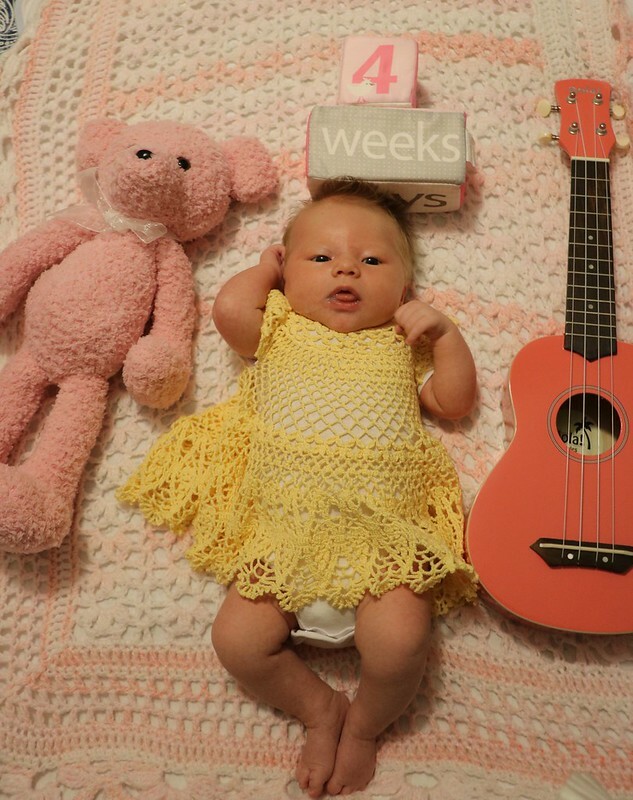 We’re thinking she is in the 9 – 9.5 lb range now. Eating – I am breastfeeding her and also pumping to start preparing to go back to work and also for nighttime feedings done by daddy. It’s getting better. At first, it was a struggle and I kind of dreaded each one, but now it’s not a big deal and we both enjoy it. I normally forget the burp cloth and then have to reach across the coffee table for it. 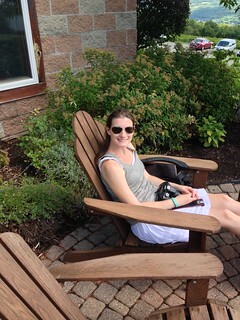 I’m not the best burp-er either, but we’re learning ways to get it done. Sleeping – She normally takes several long naps and several short naps during the day and we’re trying to get in a better nighttime routine. The last few nights, we’ve put her to sleep around 9pm and then she wakes up for the feedings around 11:30pm (Daddy does a bottle), 3:45pm (mommy wakes up and then goes back to sleep after), and 7:30am. Likes – She loves sleeping on your chest, whether mommy or daddy. She also likes resting on your legs looking at you and also eating! Dislikes – Getting her diaper or clothes changed. 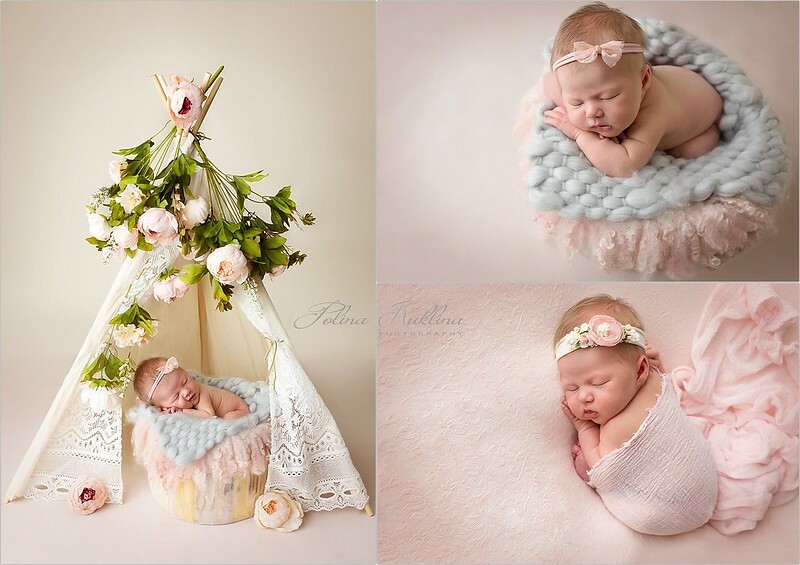 Here are some of the proofs from her newborn photo shoot. We are super lucky in that we have had lots of help. My mom was here for the first week and a half and Tony’s parents are still here helping out. I’ve gotten a little spoiled in having everyone here helping, including Tony. He is great with swaddling and calming her down. The way he talks to her and holds her is adorable! Right now, he is talking to her as he is changing her diaper in the other room, and it makes me smile. So in love with the both of them!